Arabic and Andalusian band for hire. 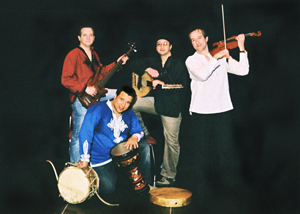 El-Andalus are the leading exponents in London of classical Arabic and Andalusian music. They are led by oud (Arabic lute) player Yazid Fentazi who has performed with Cheb Mami, Cheb Sahraoui and the Turqui Brothers. His playing has been compared to that of the great Anouar Brahem. He is accompanied by the world class derbouka playing of Karim Dellali and the exciting melodic violin of Frank Biddulph. Karim Dellali has played with Joi, Trevor Watts Moiré Music and Oojami, while Frank Biddulph’s unique improvising style on the violin has led to tours with Balkan group Mukka, and to recording work with the Waterboys and Stereo MCs. He also produced Mukka’s Radio 1 John Peel Session. The trio can be expanded to a quartet by the addition of Algerian bassist extraordinaire, Hamid Bouri. El-Andalus take the audience on a wonderful journey, often beginning with a poetic and reflective Andalusian Nuba, then travelling on to the trance-like Sufi music of the Sahara. They never fail to end the evening by getting the audience on their feet dancing to the celebratory Chabi music of Algeria, or to a classical Egyptian belly dance.